The Rebel Sweetheart. : Spotlight | Canmake Four Shiny Eyes Palette in Strawberry Chocolate. Spotlight | Canmake Four Shiny Eyes Palette in Strawberry Chocolate. 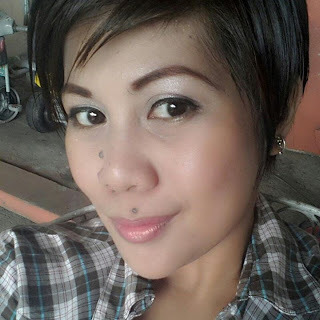 Last May, Canmake Philippines' chief makeup artist Bea Almeda held a Facebook giveaway in celebration of her birthday. At stake were the Four Shiny Eyes Palette, Eye Nuance Eyeshadow, and Candy Wrap Lip Gloss. I was lucky to be one of the winners, and for my prize I received this Four Shiny Eyes Palette in 01 Strawberry Chocolate. Canmake Four Shiny Eyes Palette. For those who are hearing the name 'Canmake' for the first time, it's a Japanese brand of drugstore makeup. Canmake finally made its way to Philippine soil, and the brand was officially launched in the country last summer. Your eyes will look bigger than ever! Achieve deep-set eyes by layering on these colors with different textures! Use this four-shade palette of eyeshadows to try a wide range of tricks for making your eyes look bigger. The Strawberry Chocolate variant is a trio of cute, pink shades plus the brown liner on the last pan. What's great about the Four Shiny Eyes Palette is that you have a lot of shades to choose from. There are seven palettes in this collection, all of them priced at 680 yen (somewhere around Php 300 or a little over US$6). It comes in a clear, plastic packaging. The case itself looks like a jewel, with studs and sparkles adorning the cover. I find the packaging really cute, though I've heard that the plastic container isn't very sturdy. Pretty much everything is written in Japanese. But the instruction guide is illustrated and easy to understand. Texture is soft and creamy, though a bit chalky. Not as highly pigmented as my other drugstore brand eyeshadows (i.e. Almay), but the shimmery and sheer colors are pretty buildable. It'll take a bit of effort to build the colors, though. Also, I've heard some complaints about this product's poor staying power, so just to be on the safe side, I use this eyeshadow with a primer on. I was able to wear this for a good eight hours without creasing or fading. Either they have improved the formulation, or my primer is pretty damn good. Haha! - Now available in the Philippines. - Staying power is good, when used with a primer. - No allergic reactions; safe for sensitive skin. - Save for the brown liner on the last pan, pigmentation is so-so. Fairydrops Volume Burst Mascara, Ever Bilena Eyebrow Liner. CHEEKS: Tony Moly Cat Chu Wink. Get to know more about Canmake here. I don't think they sell this brand in the US-at least I have never heard of it before--those are pretty shades of pink-I do like that they include an eyeliner as part of the palette. If I happen to see this in a drugstore here (in the US) I will check it out to see if I like one of the color choices. The shimmers is perfect for evening makeup. Fantastic! :) I like it on you, looks good. love the shades! ganda :) bagay sa'yo! I love this color palette! I think it is great that they include instructions on where to apply each color. I could use the help! I've never heard of strawberry chocolate eyeshadow before. I love these colors! Such pretty colors! I love the shimmery look :) You look so pretty! I love the look sis. It looks good on you. The shades are my kind of colors too! What eye primer did you use? Hi Genzel! I used Majolica Majorca's Skin Pore Lingerie. I don't use a separate eye primer, haha. I love those colors. I like to wear pinks and browns myself. They looked really nice on you! Maybe someday this brand will make it to the US. I love the colors. I wonder when they will come to America. I should have asked my Tita to pick some up while she is visiting back home. I haven't heard of this brand! But it has a really nice, smooth finish. I like the shimmer, too. Reminds me of smashbox? these colors are so beautiful. I like the colors of this palette! Affordable too. I wonder where they are sold. The shimmer is just perfect, not too shiny unlike other eyeshadows that I have encountered. This one can also be worn daytime. I asked Pipay to get these for me in Japan. You should try the Milk Chocolate version! I used literally everyday since I got it until I hit the pan. Haha! Canmake's shadow base/primer is really nice too. thanks for sharing it! another make up style that i learn from your blog..